Via etsy, I had an inquiry about making a custom quilt, in mid September. We went back a forth a little, and the buyer, Amy, sent me a 50% deposit this month, and I placed a fabric order. This is the quilt she wants, I'm sure you've seen it on Pinterest. Here is the original source. Even though it isn't one of my designs, I'm pretty sure it will turn out wonderful. I purposely ordered too many colors, thinking I was sure to hit the correct 12, wrong. Even making my best guess, I was a little off on colors. Here are the ones' that made the "cut", pun intended. I've ordered some Kona Pink Blush, to fill the empty spot. While I'm waiting for the fabric, I'm going to start on the math. 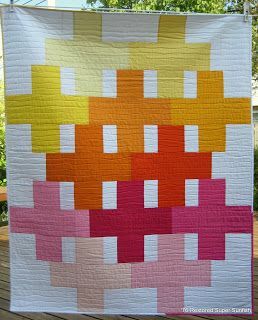 Amy wants a queen sized quilt, and she wants only one color in the binding, the lightest yellow. Here are the leftovers. My daughter Carrie has asked me to make her a quilt, using light pinks and yellows, she calls them non-colors, so some of these will go right into that project. Wat is the pattern??? Love the colors!!! There is no pattern, But I think it's pretty straightforward, I'm figuring out the math, now.